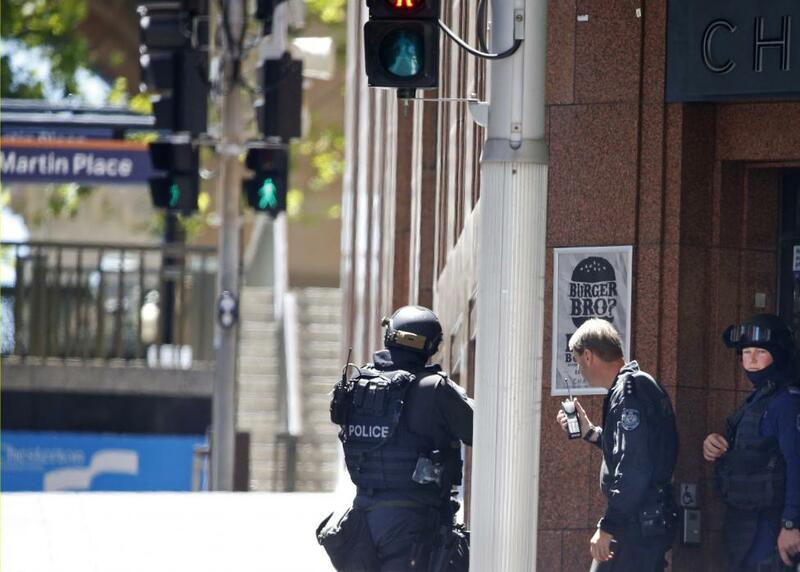 SYDNEY - Australian Prime Minister Tony Abbott on Thursday admitted Sydney's cafe siege was "an horrific wake-up call" as details emerged of the final minutes of the standoff which left the gunman and two hostages dead. 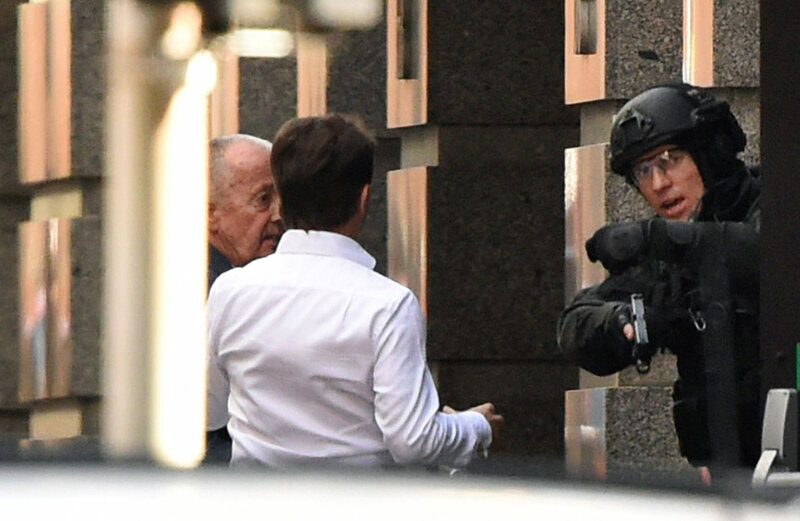 Abbott has ordered an urgent enquiry into the circumstances surrounding the tragedy and why deranged self-styled Islamic cleric Man Haron Monis was not under surveillance given his history of extremism and violence. 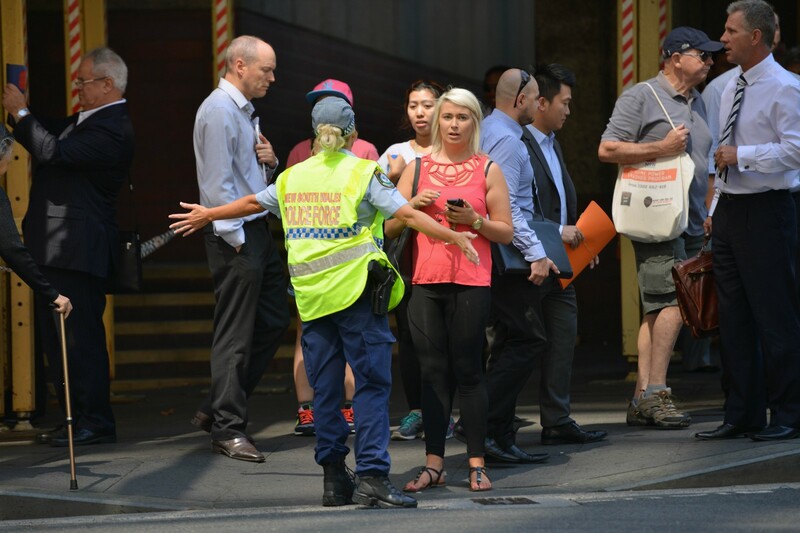 The Iranian-born 50-year-old was on bail for a string of charges, including sexual offences and abetting the murder of his ex-wife. 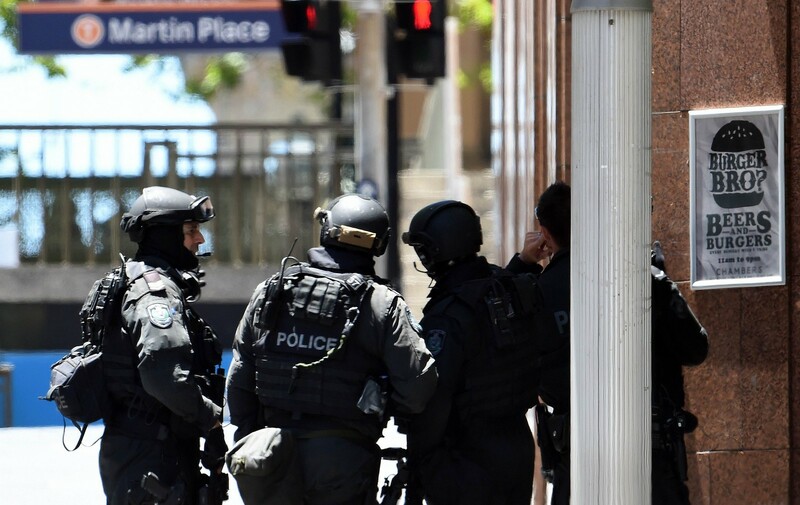 "This has been a horrific wake-up call," Abbott told Macquarie Radio when asked if this was an accident waiting to happen, amid criticism that various authorities failed to act to take Monis off the streets. 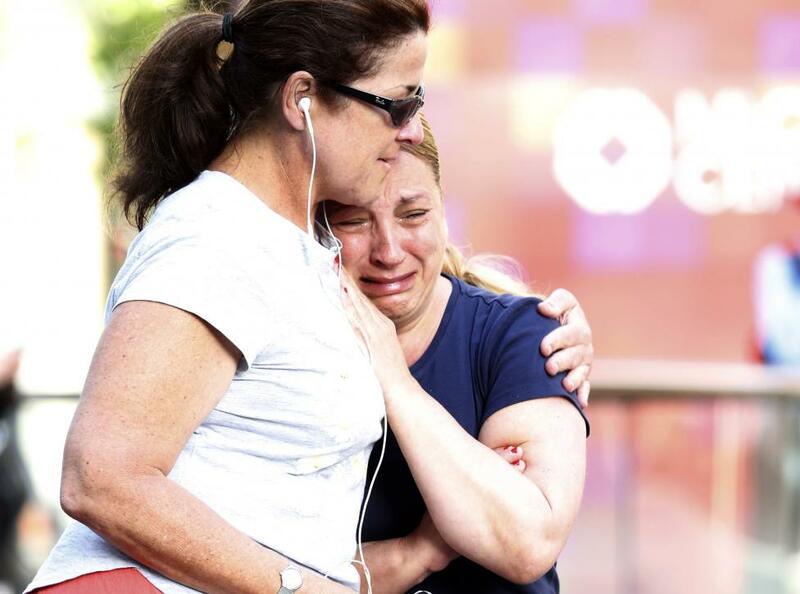 "The tragedy is that this has happened. 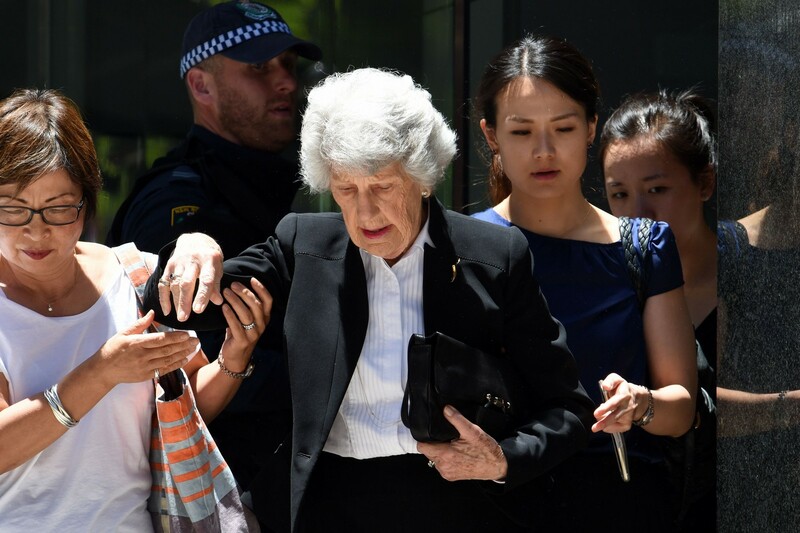 I mean, this was an atrocity, it may well have been a preventable atrocity, and that's why this swift and thorough review is so important." 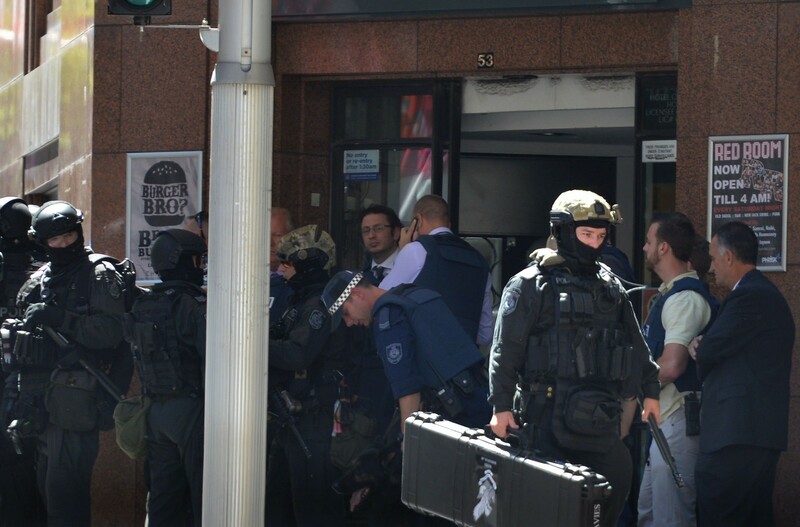 Monis, who was well known to authorities but not any counter-terror watchlists, took 17 hostages at a cafe in the heart of Sydney on Monday, unfurling an Islamic flag during a 16-hour siege. 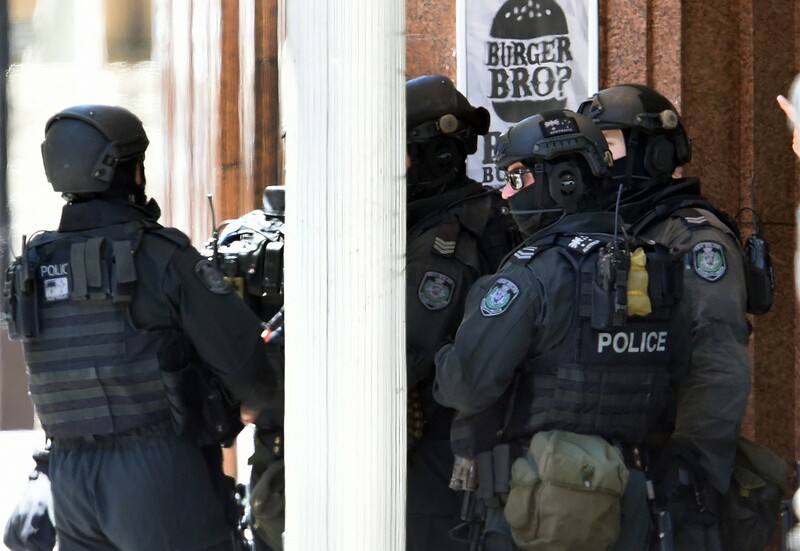 He was killed along with two victims - the cafe's manager, 34, and a 38-year-old mother-of-three - in a bloody end to the standoff. 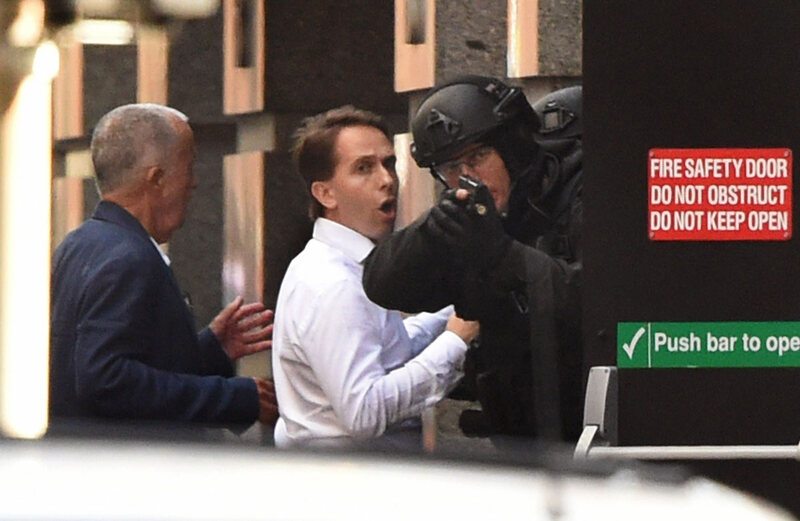 Details of why police moved in when they did are sketchy but the father of a hostage who escaped said it was triggered by a group of them deciding they would "not survive until the morning if they did not do something". 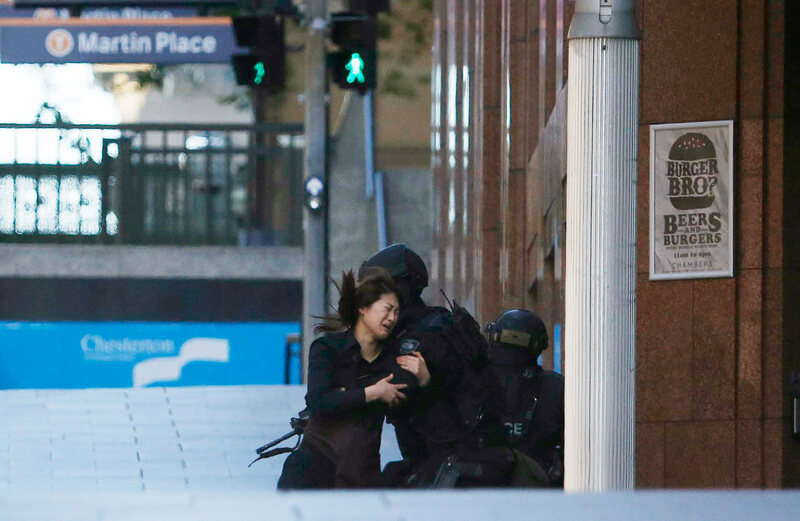 Bruce Herat, the lawyer father of Joel Herat, 21, said Monis was awake and agitated and had begun herding the frightened hostages into separate groups. 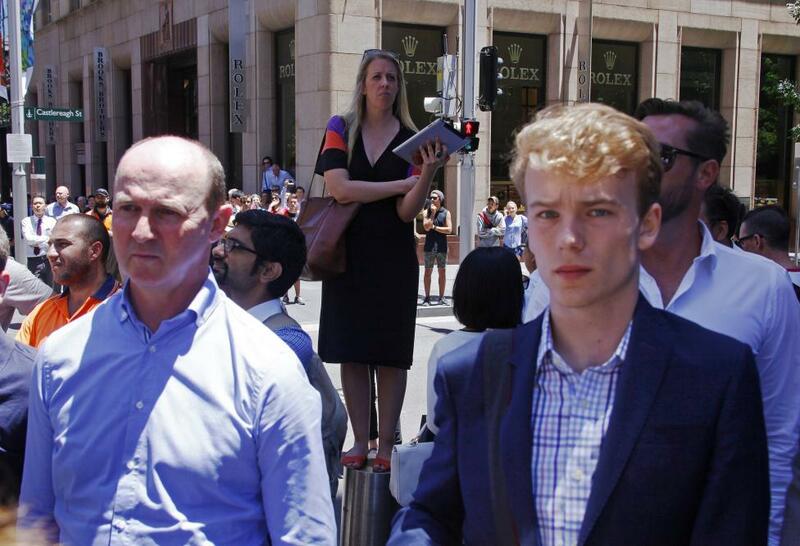 "And at that point in time, Joel and five others came to the conclusion that they were not going to survive until the morning if they did not do something," he told Fairfax Media, adding that they decided to kick down an internal door. 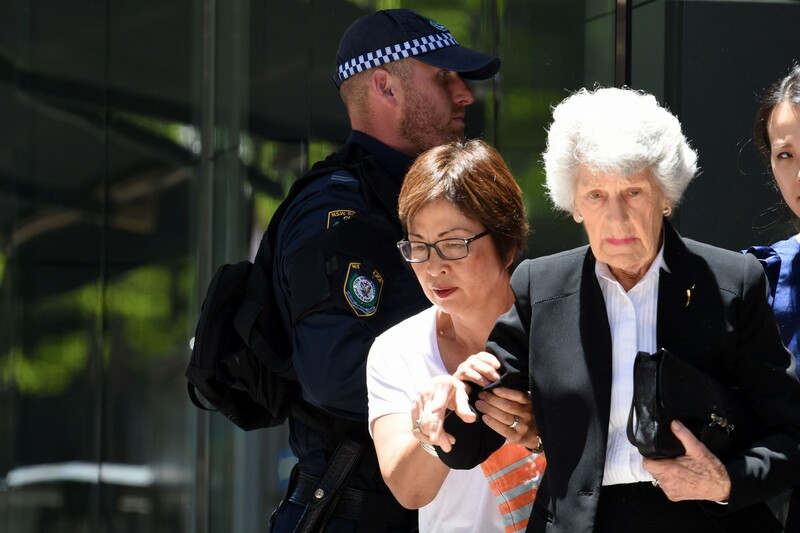 "And I know that Joel made sure that Harriette (Denny) ... got behind him and he said, 'You're coming with me', and basically made sure that all that group were ready to go when Joel and Jarrod (Hoffman) broke down the door." 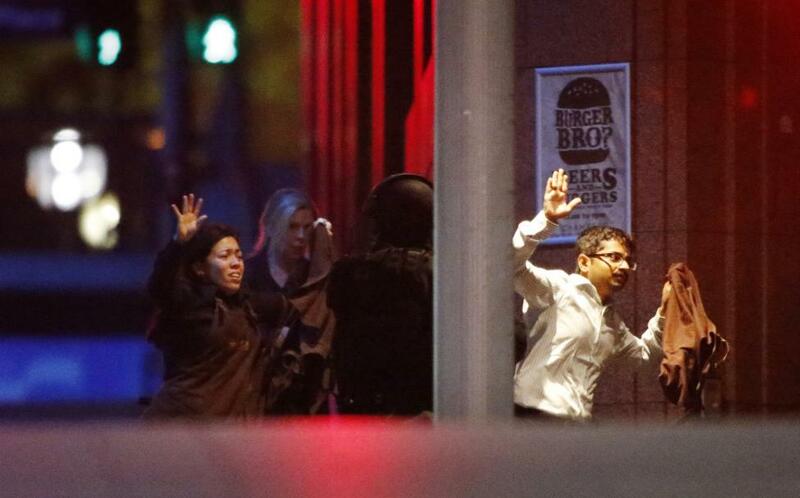 This group of people were those seen fleeing seconds before heavily-armed stormed the Lindt cafe. 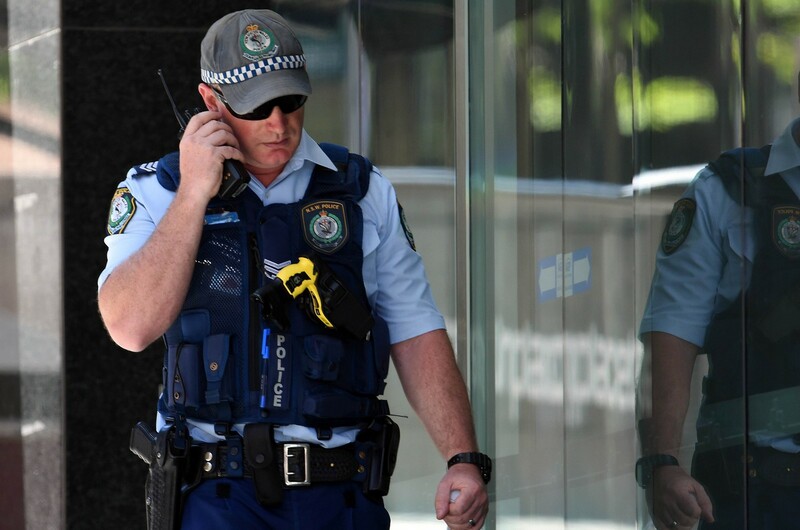 Police have so far not commented on the chain of events. 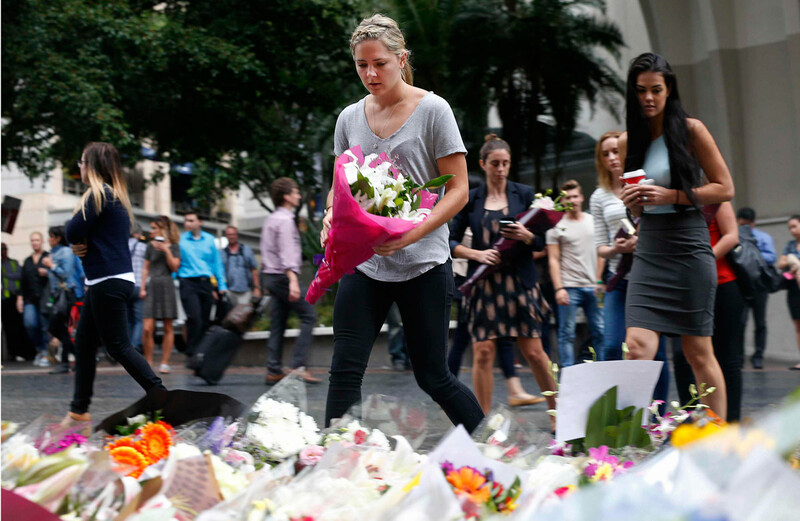 The siege has touched a nerve among Australians, who began laying flowers at a makeshift memorial in the heart of Sydney's financial quarter on Tuesday. 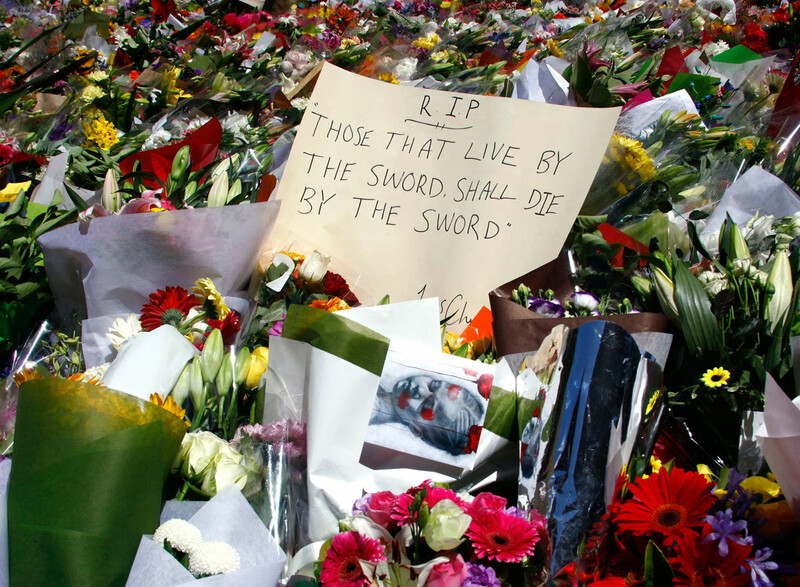 The floral tribute continues to grow bigger and New South Wales state Premier Mike Baird said a permanent memorial would likely be erected near the cafe. 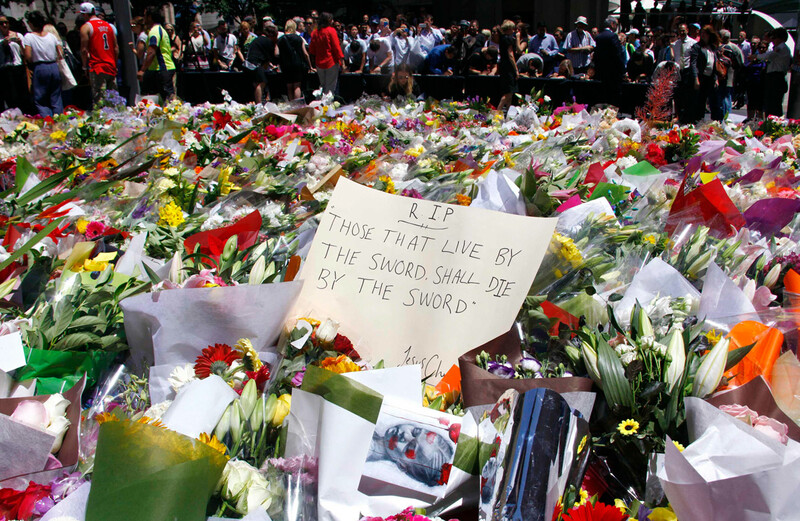 "This is something that will be with us forever. 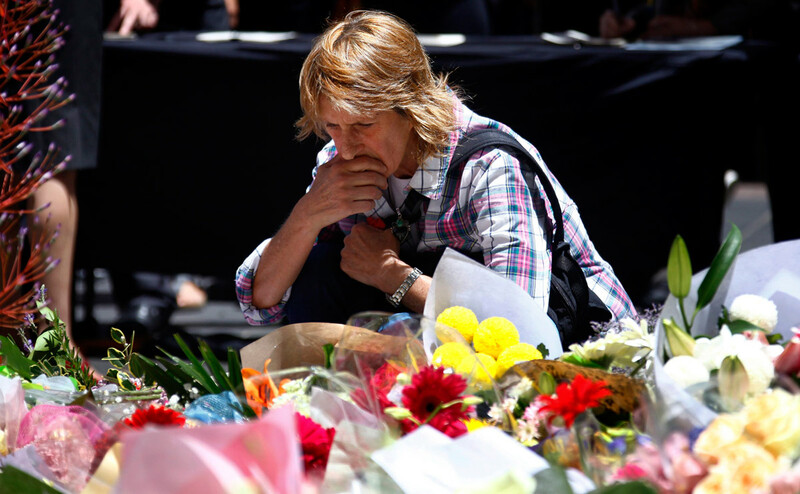 We need to recognise that and pay tribute to the inspiring Australians that we have lost, and what they have given us," he said. 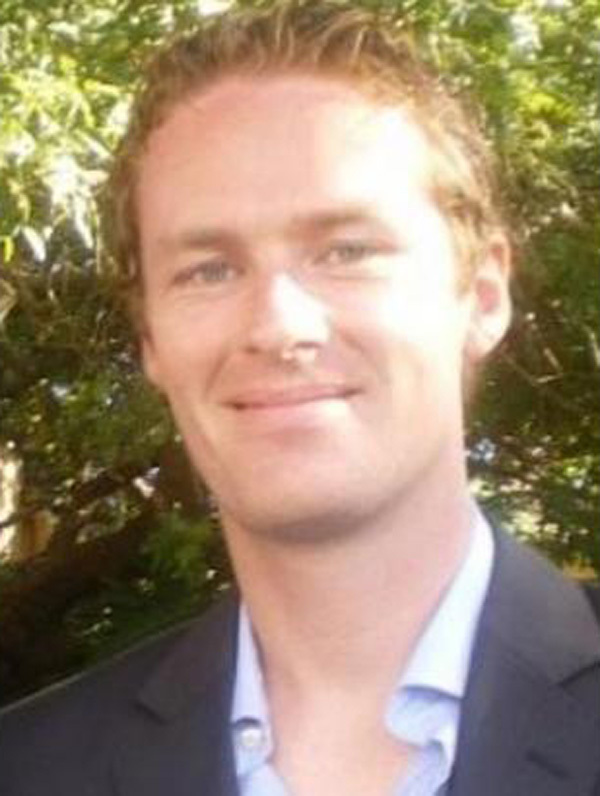 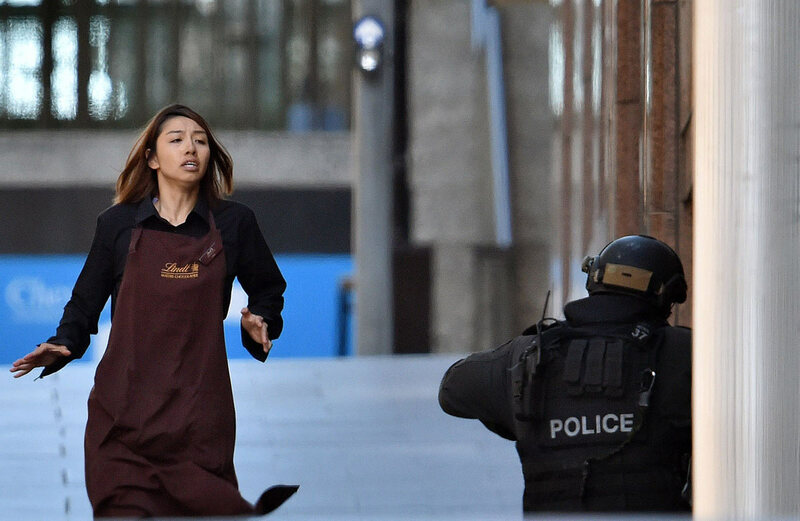 The 34-year-old manager of the Lindt Chocolat Cafe, Tori Johnson was shot while trying to grab the gunman's weapon, sources told Australian media. 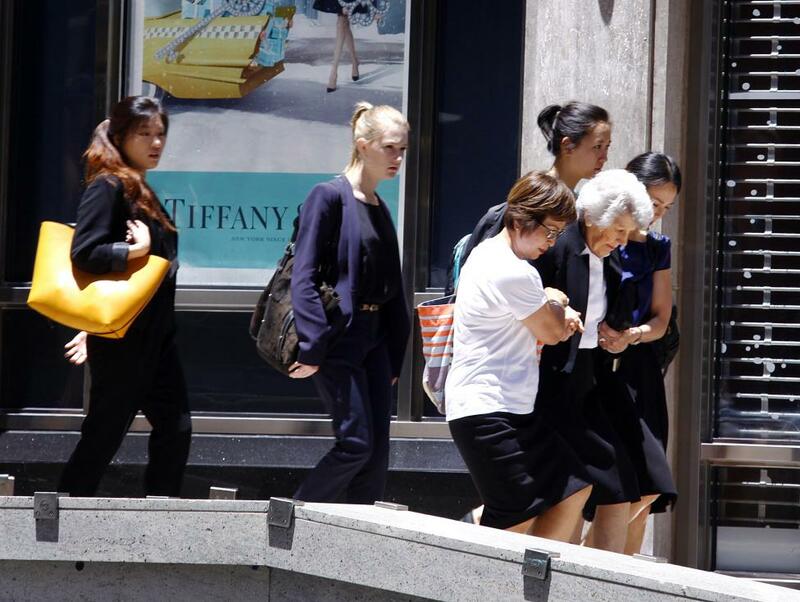 Katrina Dawson has been confirmed as one of the two victims killed in the Lindt Chocolate Cafe siege in Sydney. 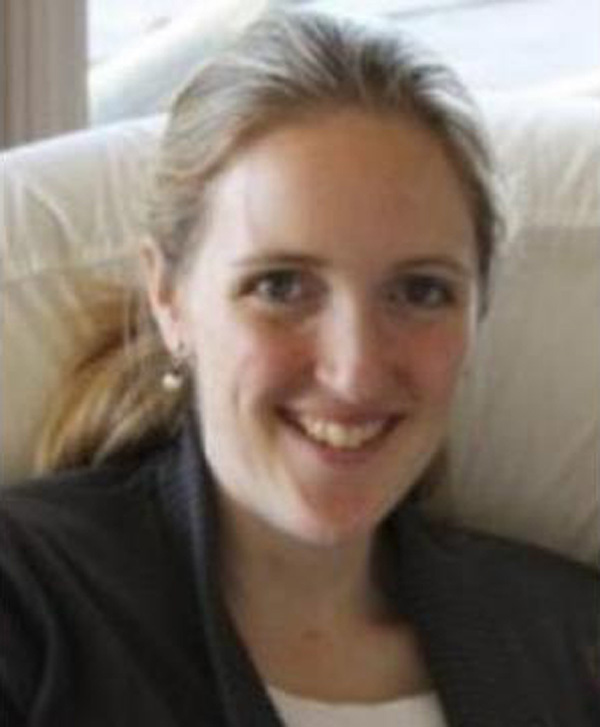 She is a barrister and mother of two daughters and a son. 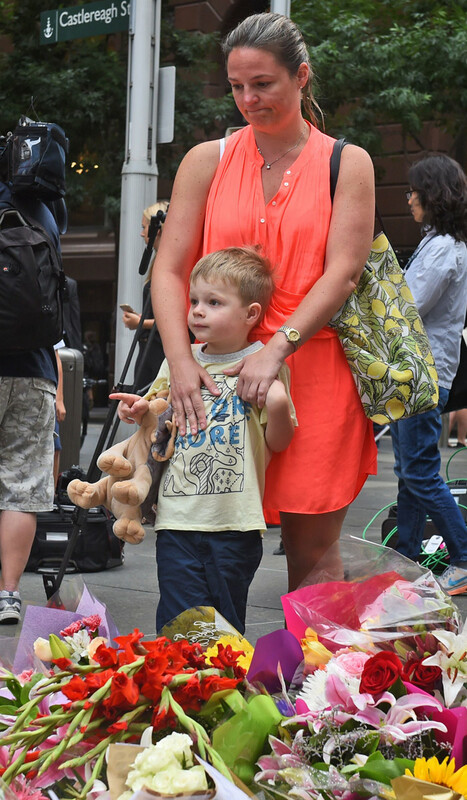 Her youngest daughter is aged 4. 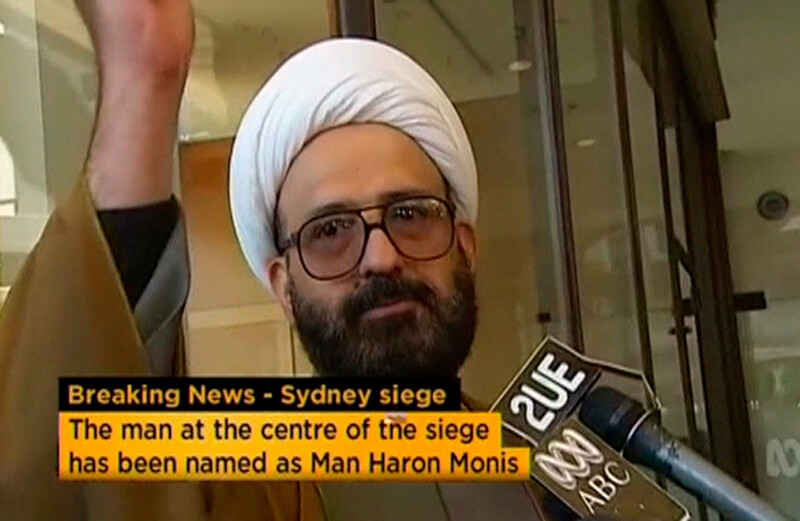 Killed suspect: Self-appointed Sheikh Man Haron Monis, the extremist Iranian-born gunman with a criminal history. 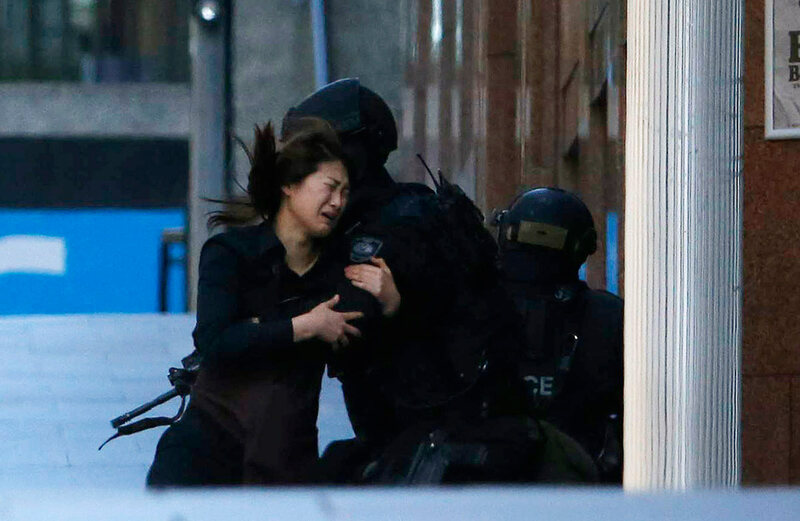 Police rescue personnel carry an injured woman from the Lindt cafe, where hostages are being held, at Martin Place in central Sydney December 16, 2014. 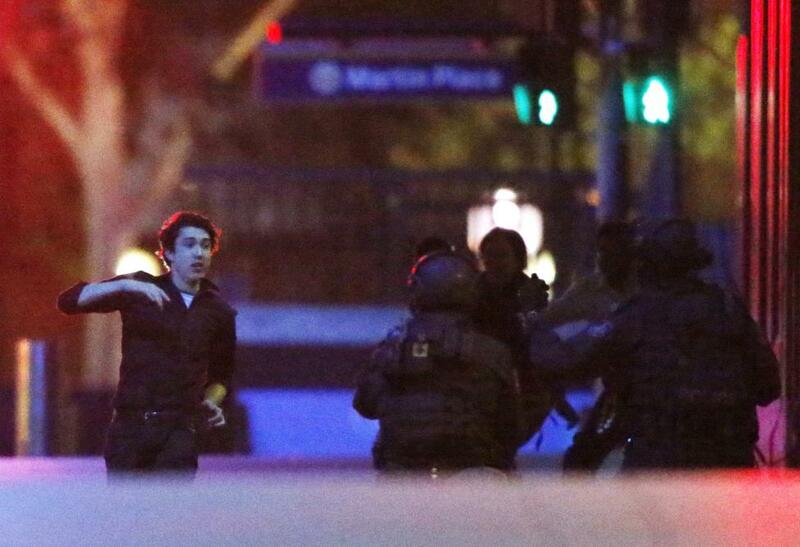 Hostages run towards a police officer (R) near Lindt Cafe, at Martin Place in central Sydney December 16, 2014. 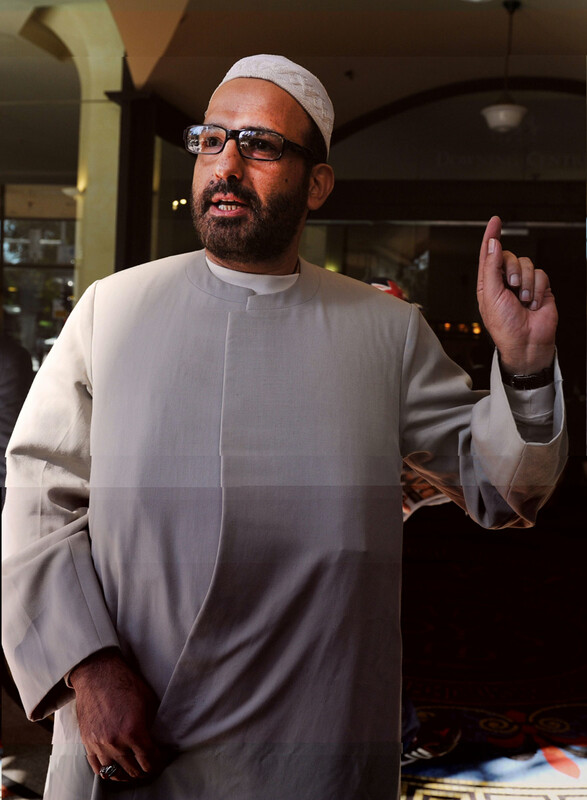 Self-appointed Sheikh Man Haron Monis, the extremist Iranian-born gunman with a criminal history. 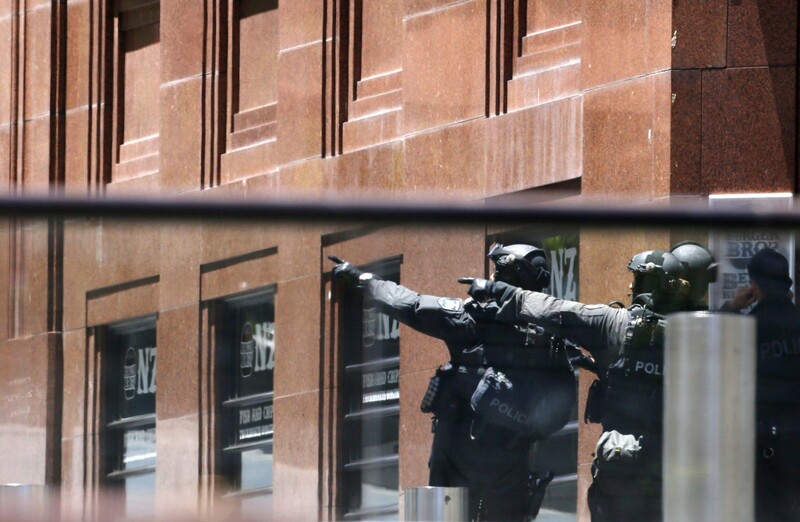 Two heavily armed police officers assist a hostage away from Lindt Cafe in Martin Place in central Sydney December 16, 2014. 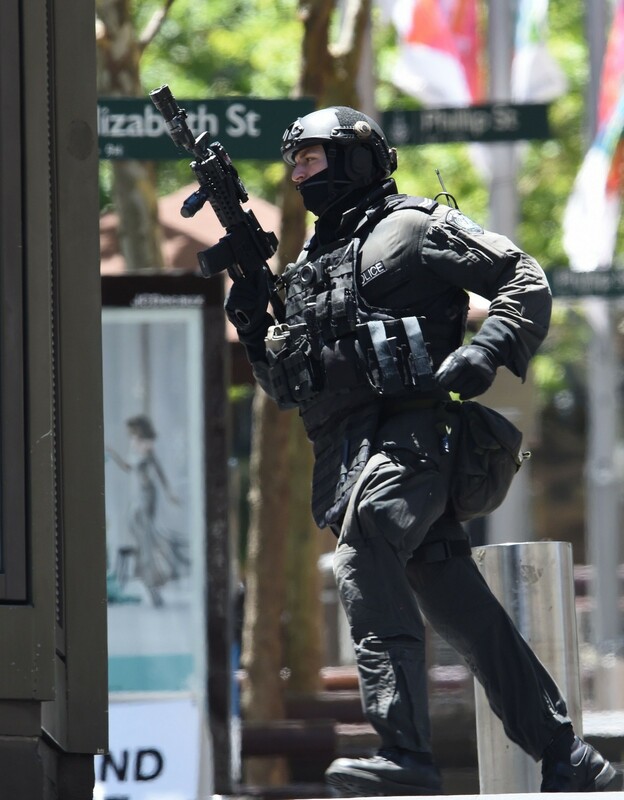 A heavily armed policeman holds his weapon as paramedics rush towards the Lindt cafe, where hostages are being held, at Martin Place in central Sydney December 16, 2014. 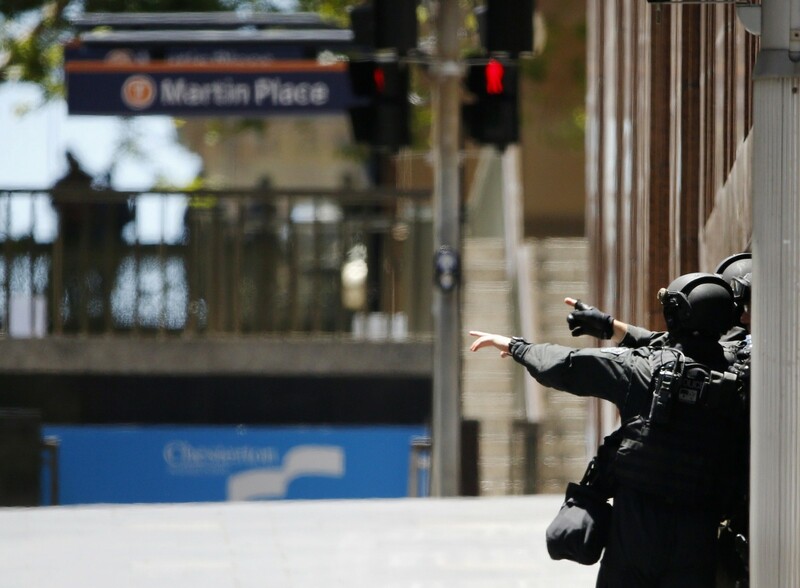 A hostage (L) runs towards police officers near Lindt Cafe, at Martin Place in central Sydney December 16, 2014. 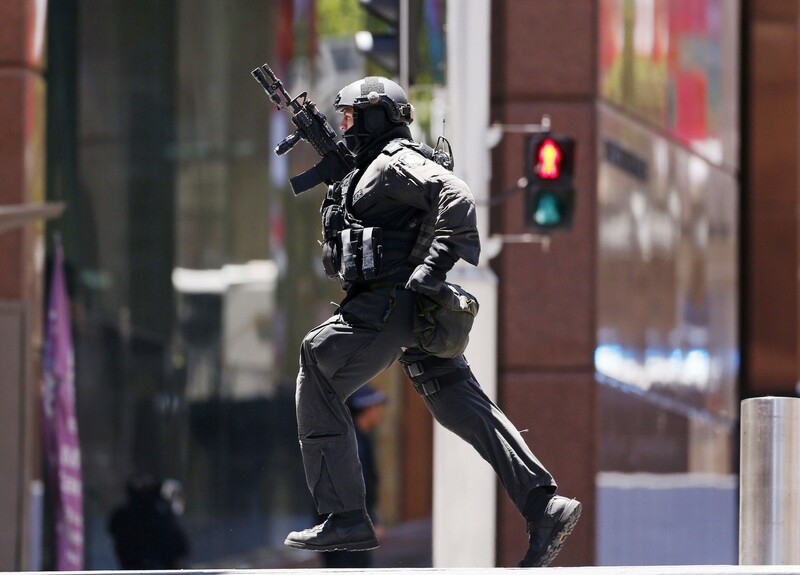 Hostages run past a police officer (C) near Lindt Cafe in Martin Place in central Sydney December 16, 2014. 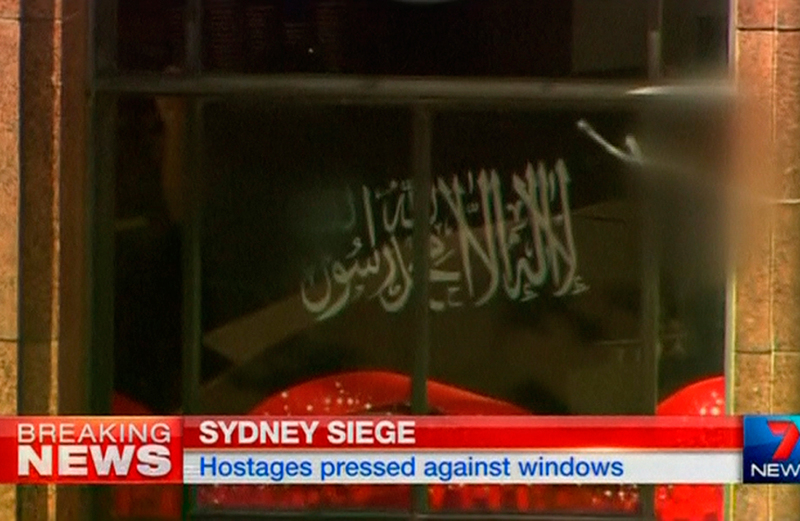 Screengrab from TV broadcast shows presumed hostages holding up a flag with Arabic writing. 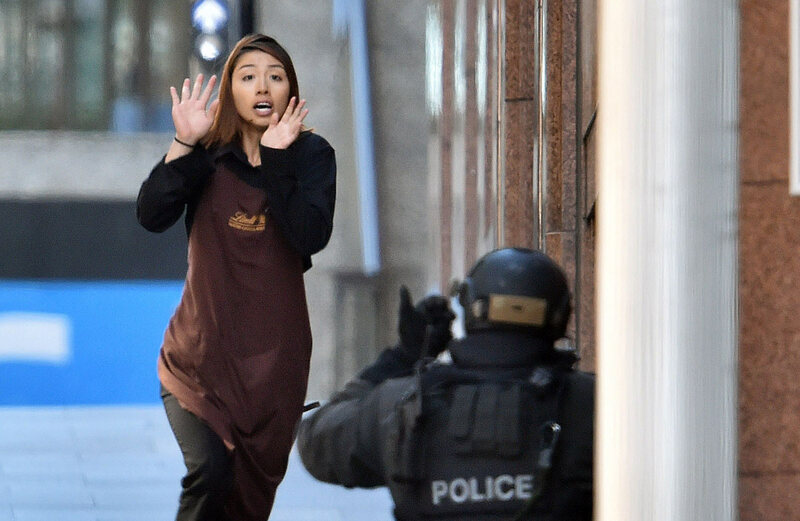 A hostage runs out of the cafe. 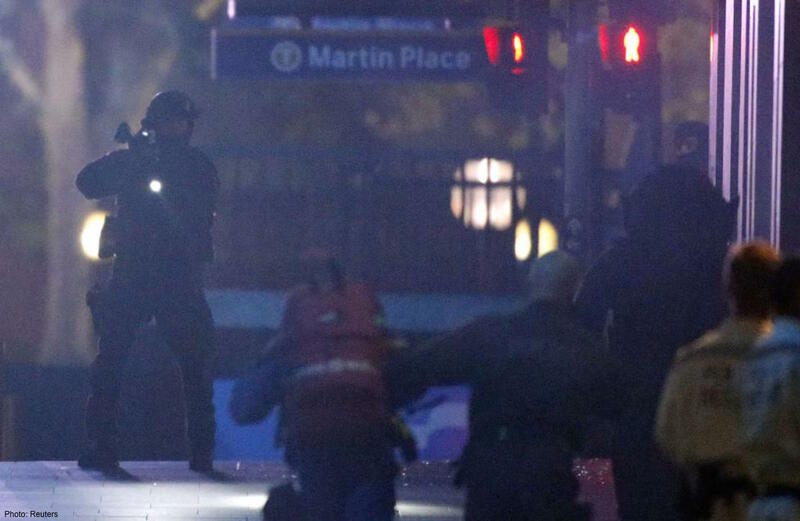 Two hostages (Lt) run for cover behind a policeman. 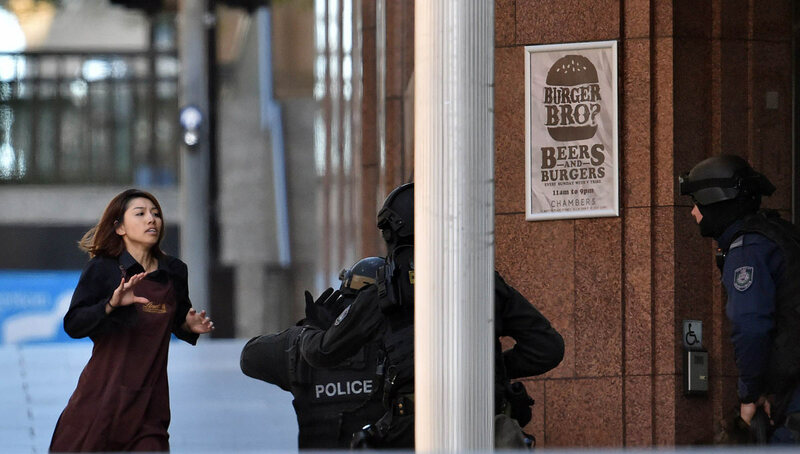 Two men run out of the Lindt cafe. 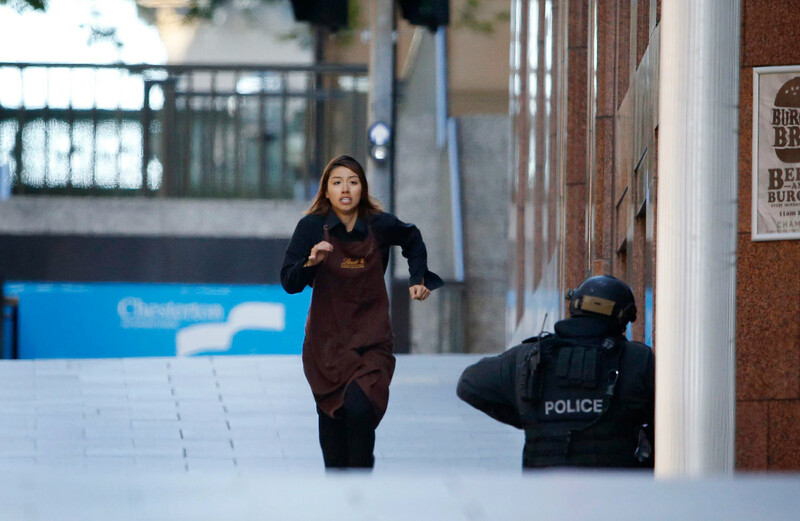 Two hostages (far left and far right) escape from the Lindt cafe during a siege by a gunman. 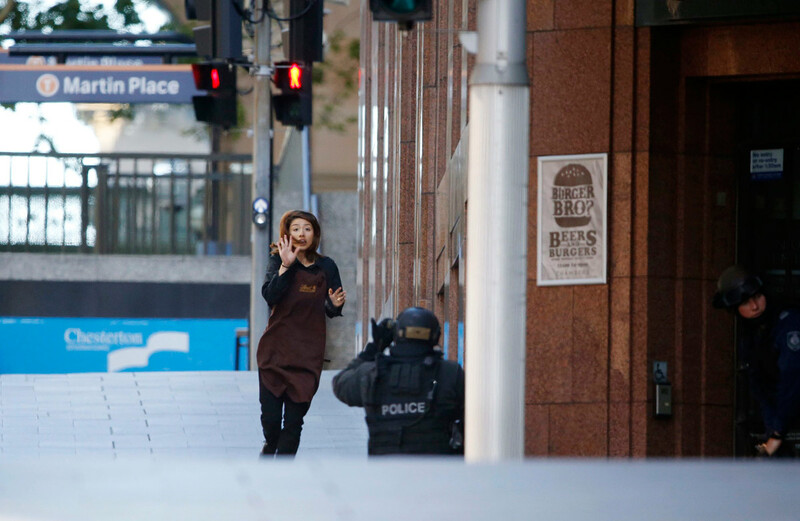 Two hostages (L) run for cover during a siege of the Lindt cafe. 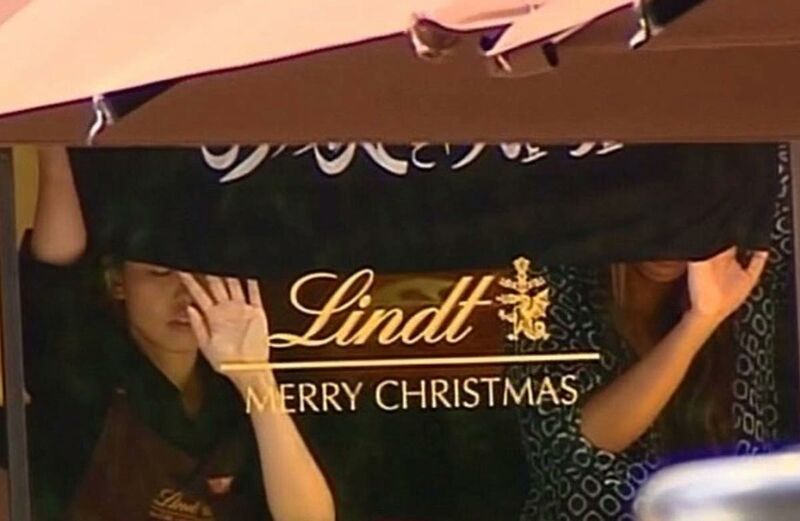 A black flag with Arabic writing is held up at the window of the Lindt cafe. 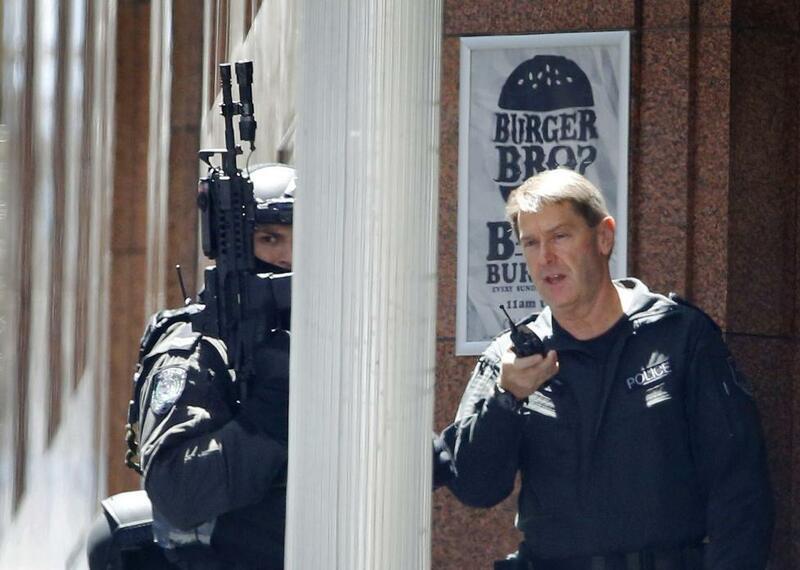 A hostage escapes from the Lindt cafe. 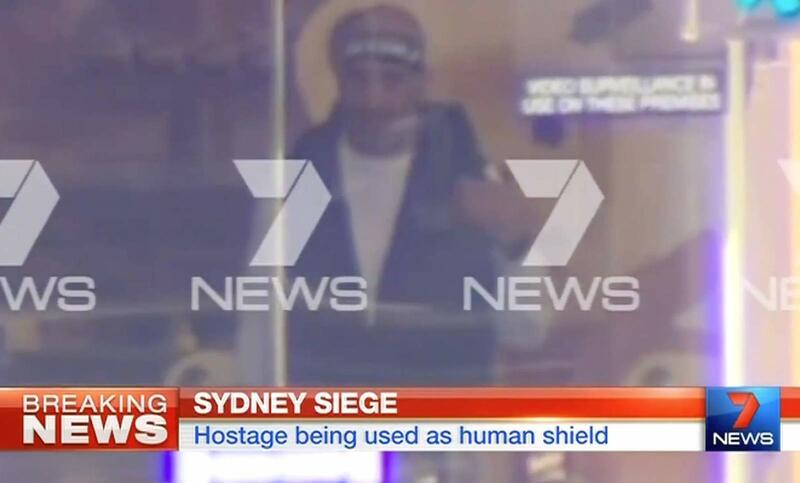 Hostages were being held inside a central Sydney cafe where a black flag with white Arabic writing could be seen in the window. 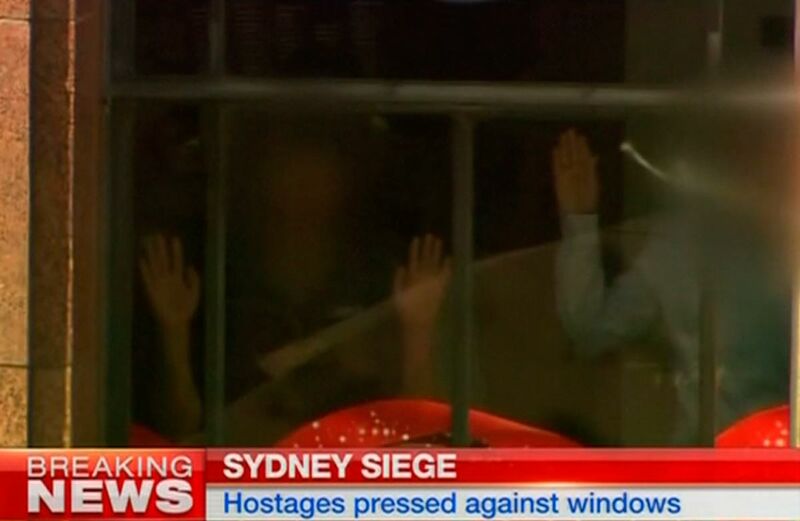 Hands are pressed up against the window of the Lindt cafe where hostages are being held. 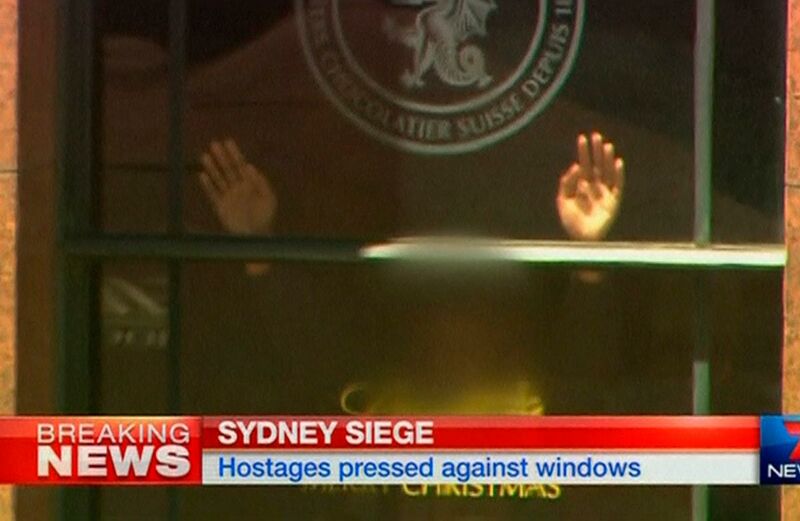 Hands are press up against the window of the Lindt cafe where hostages are being held. 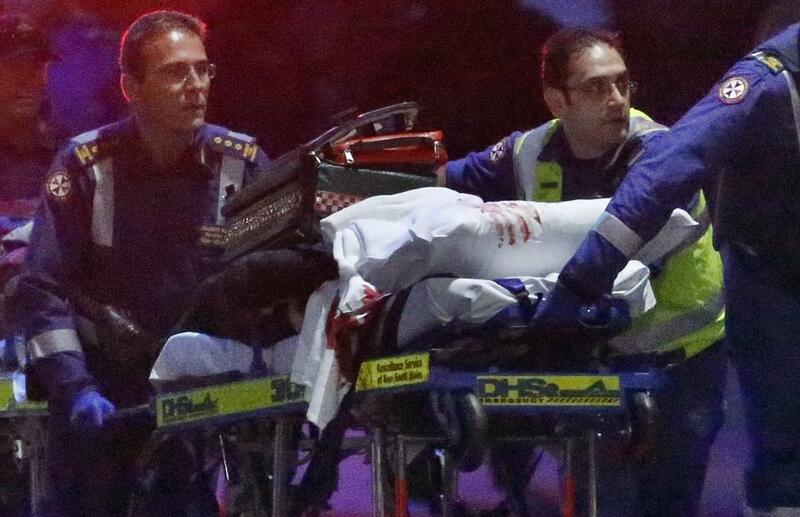 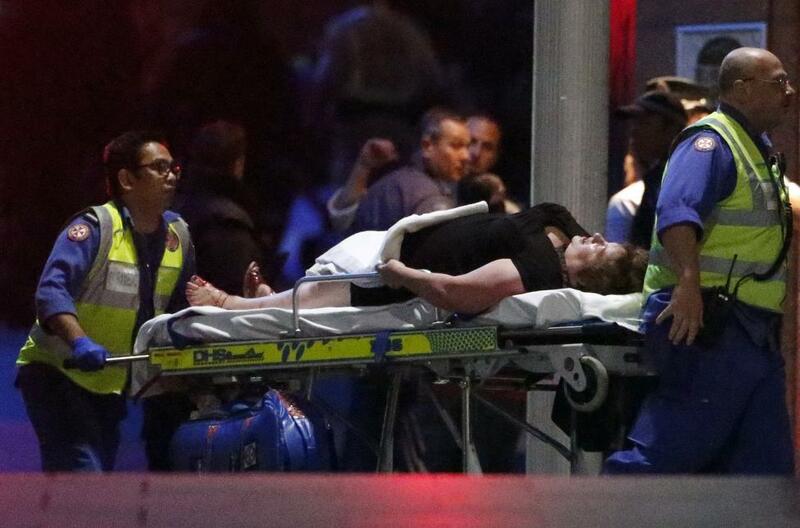 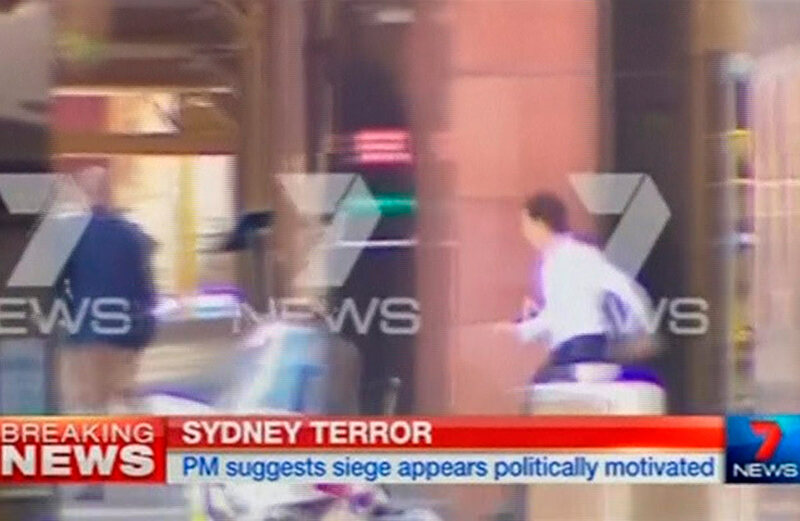 Local television showed scenes of the siege in Sydney on Monday, raising fears of an attack linked to Islamic militants. 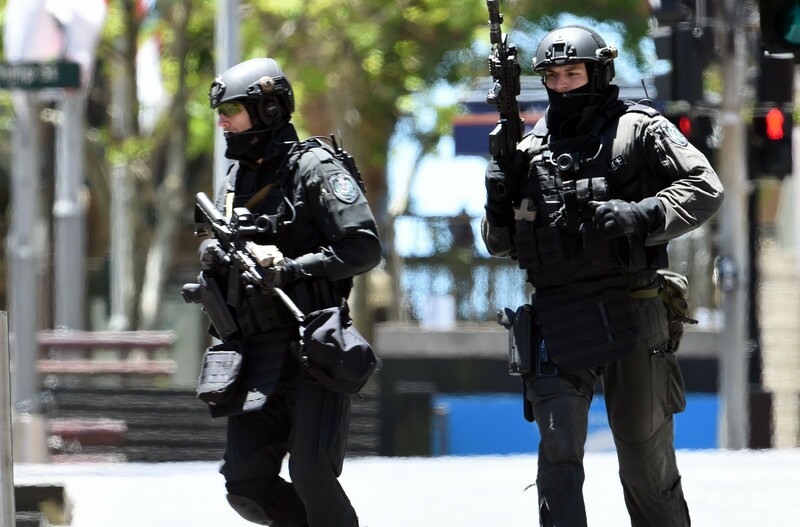 Australia is backing the United States and its escalating action against Islamic State in Syria and Iraq. 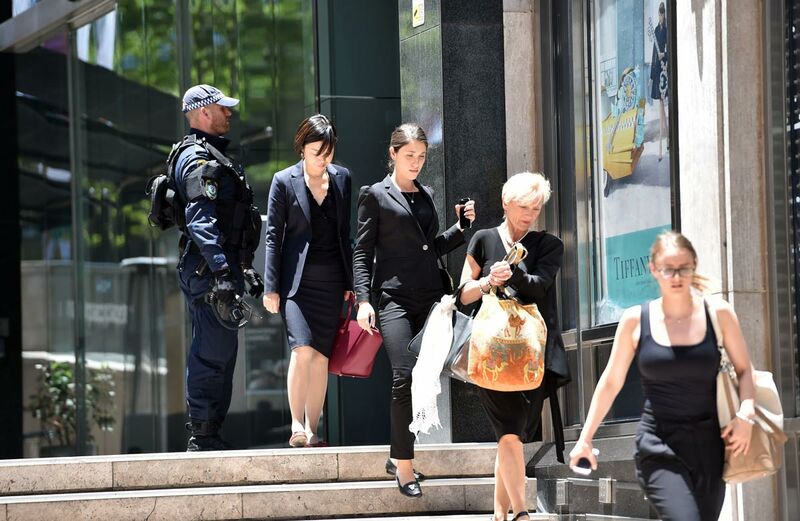 Prime Minister Tony Abbott said he was convening a meeting of the cabinet's national security committee. 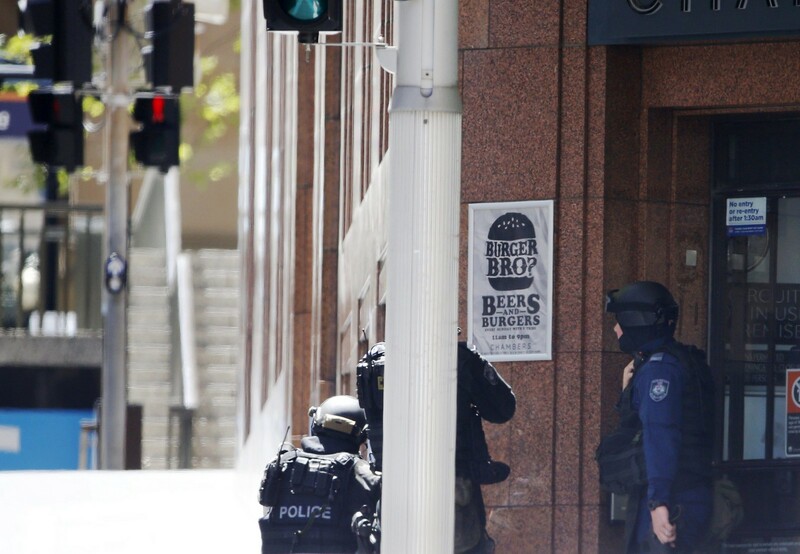 He called it a hostage situation in Australia's commercial capital. 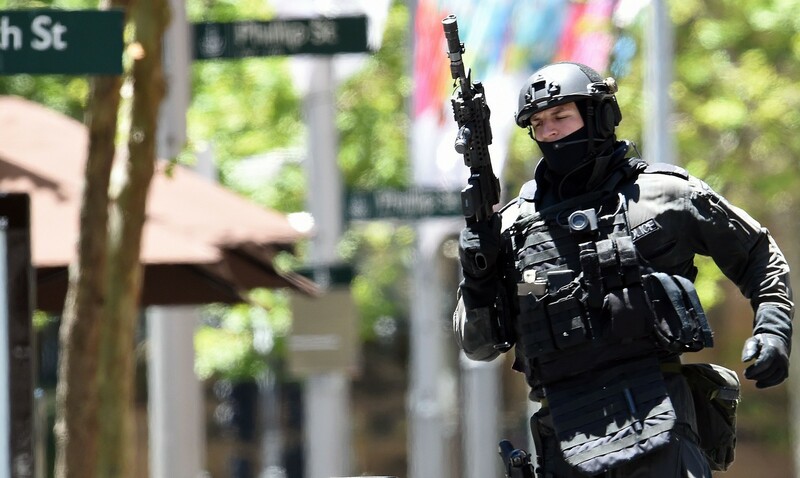 Australia's backing for the US means it is on high alert for attacks by radicalised Muslims or by home-grown fighters returning from the conflict in the Middle East. 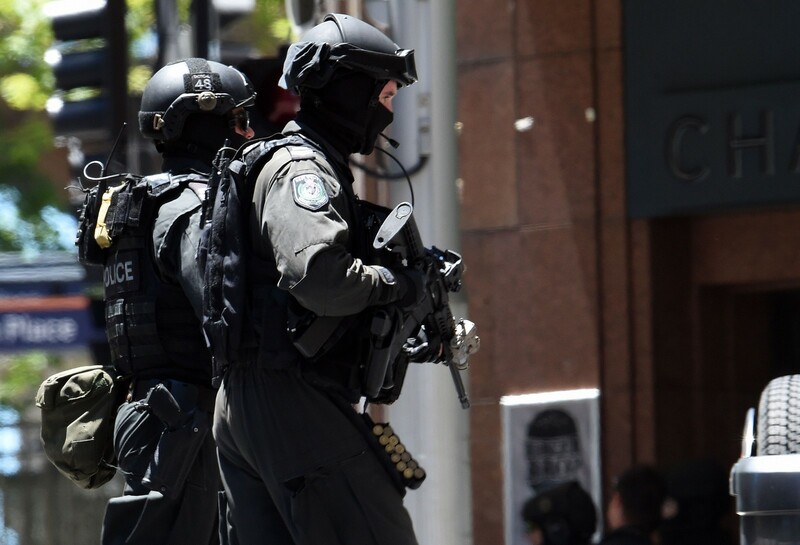 Dozens of heavily armed police surrounded the Lindt Cafe in Martin Place. 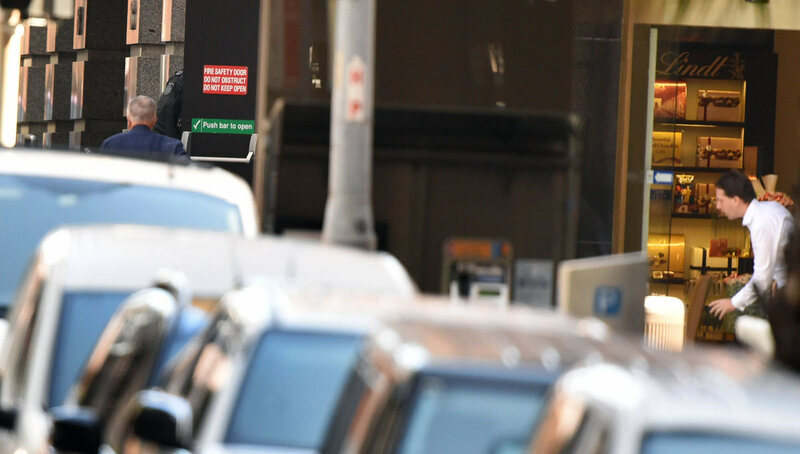 Martin Place in central Sydney is home to the Reserve Bank of Australia, commercial banks and close to the New South Wales (NSW) state parliament. 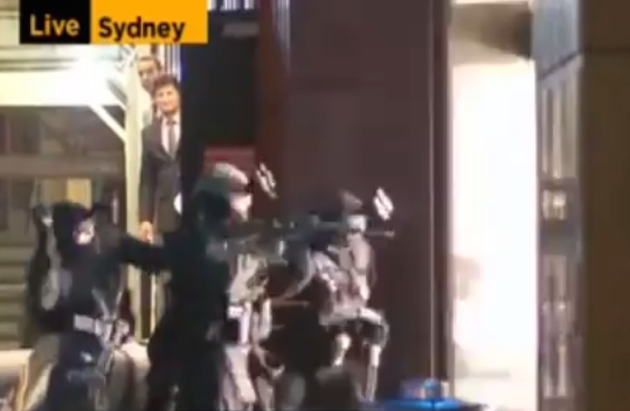 Live television footage showed patrons inside the cafe standing with their hands pressed against the windows. 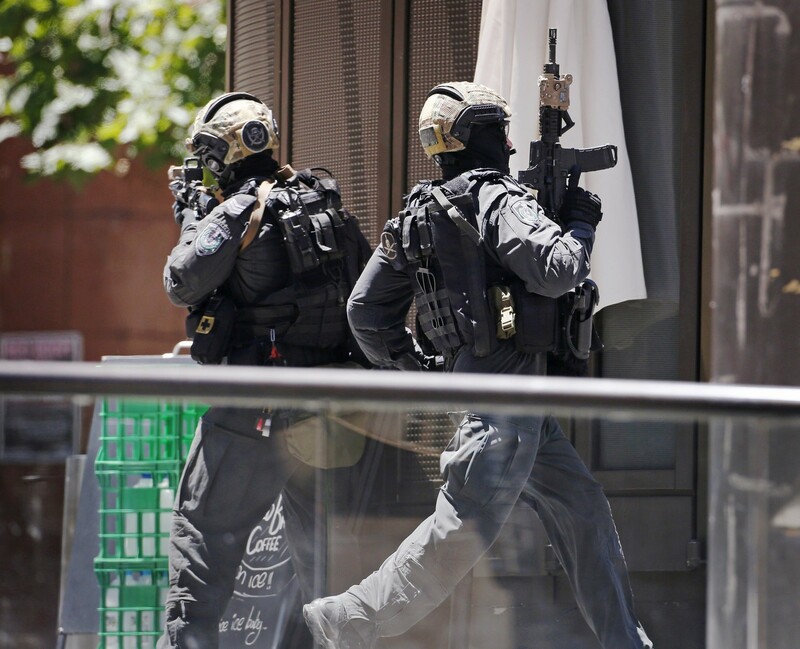 A black and white flag similar to those used by Islamic State militants in Iraq and Syria was also visible. 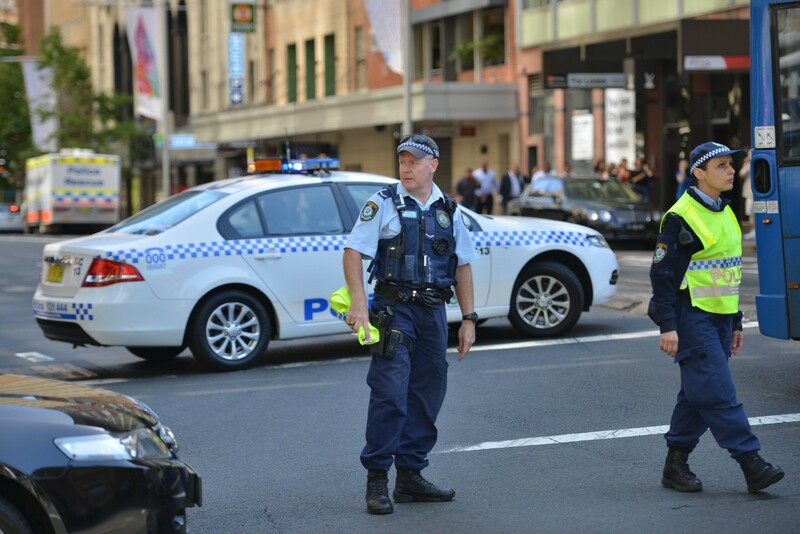 NSW Police tweeted: "A police operation is underway in Martin Place, Sydney's CBD. 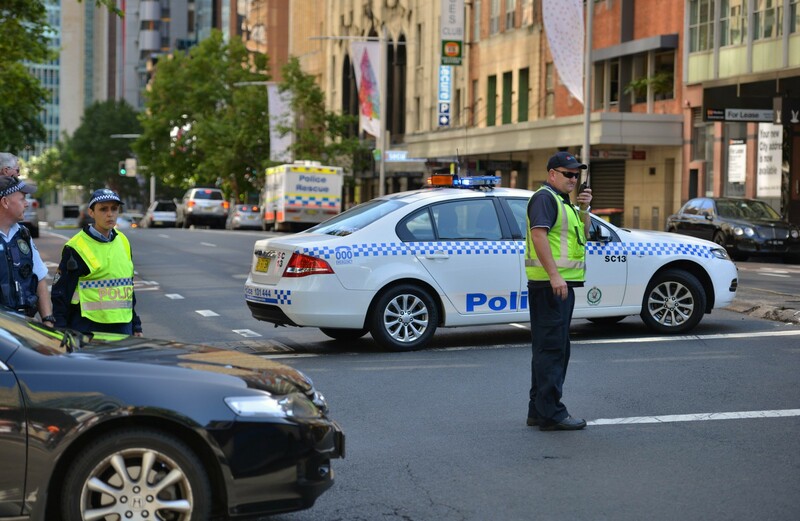 People are advised to avoid the area." 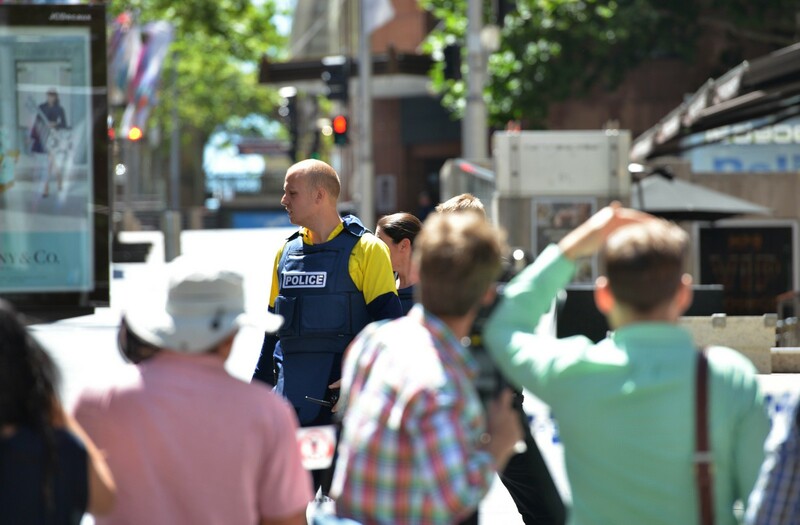 A couple of hundred people were being held back by cordons and the fire brigade's hazardous unit was on the scene. 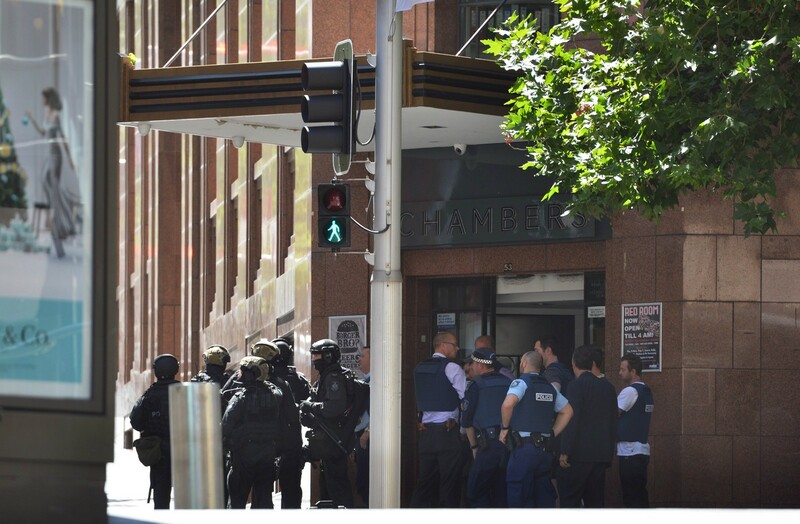 The Reserve Bank of Australia, near the cafe, said staff had been locked down inside the building, and were all safe and accounted for. 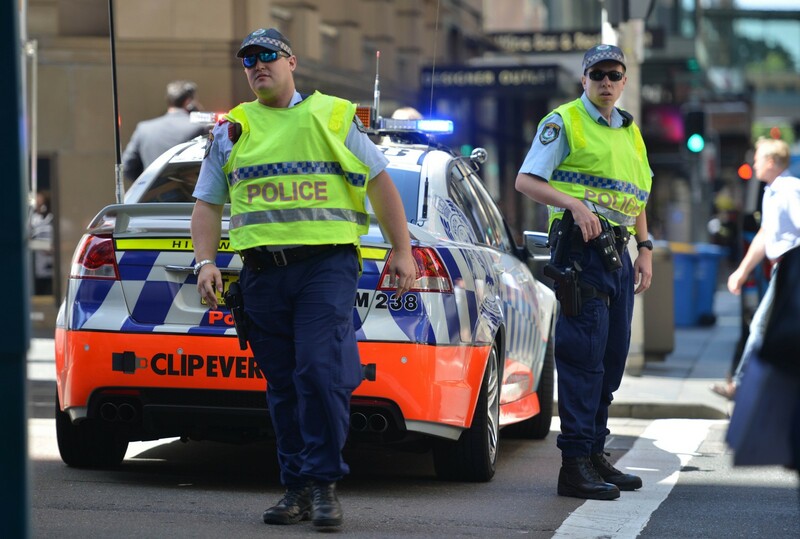 Local media reported that the nearby Sydney Opera House had been evacuated after a suspicious package had been found. 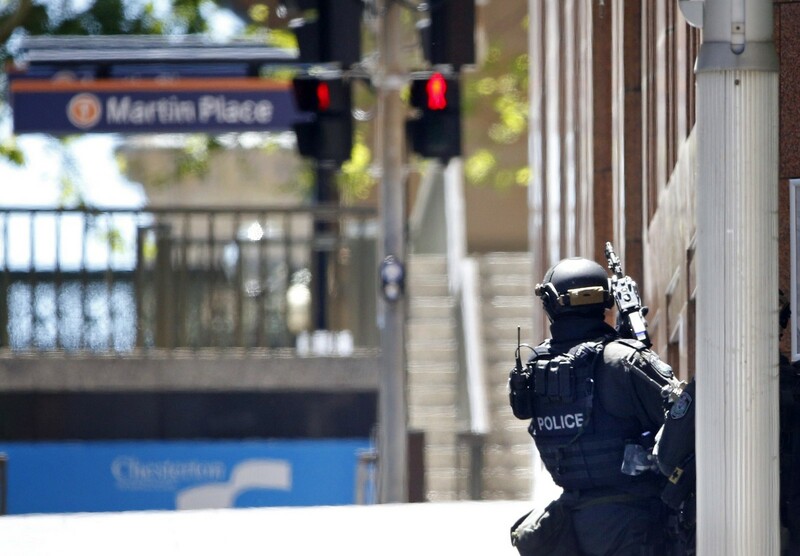 Trains and buses were stopped and roads were blocked in the area, with train operators saying there had been a bomb threat at Martin Place. 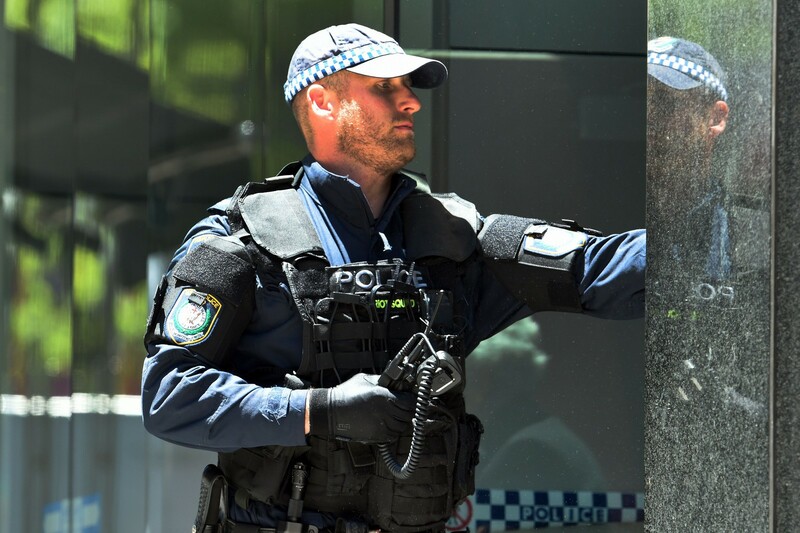 In September, Australian anti-terrorism police said they had thwarted an imminent threat to behead a random member of the public. 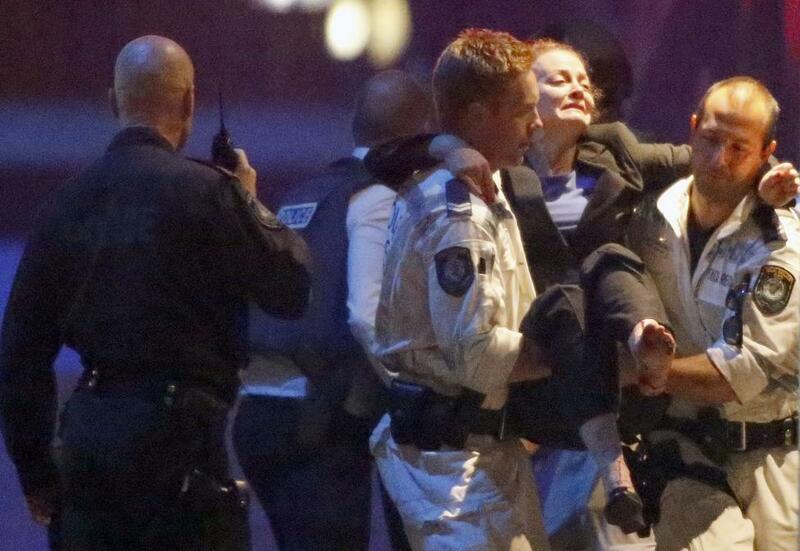 A woman is assisted as a group of people are evacuated by police from a building next to Lindt cafe. 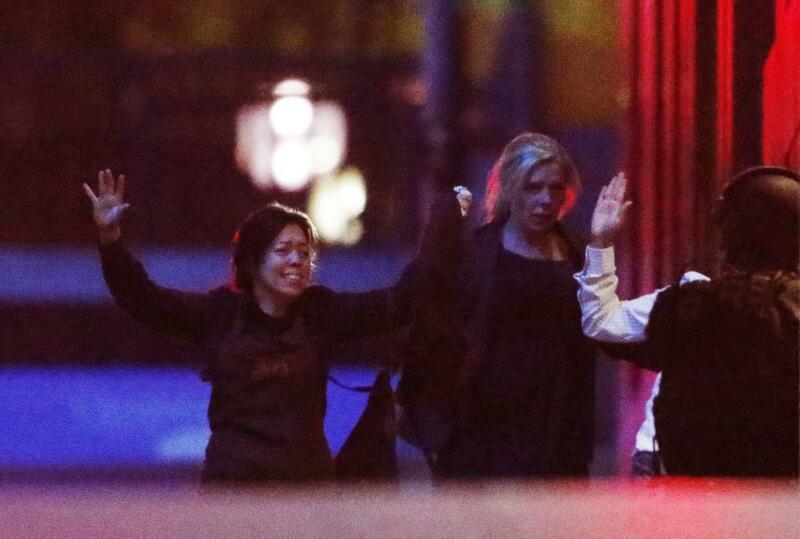 Police officers gesture near Lindt cafe in Martin Place, where hostages are being held. 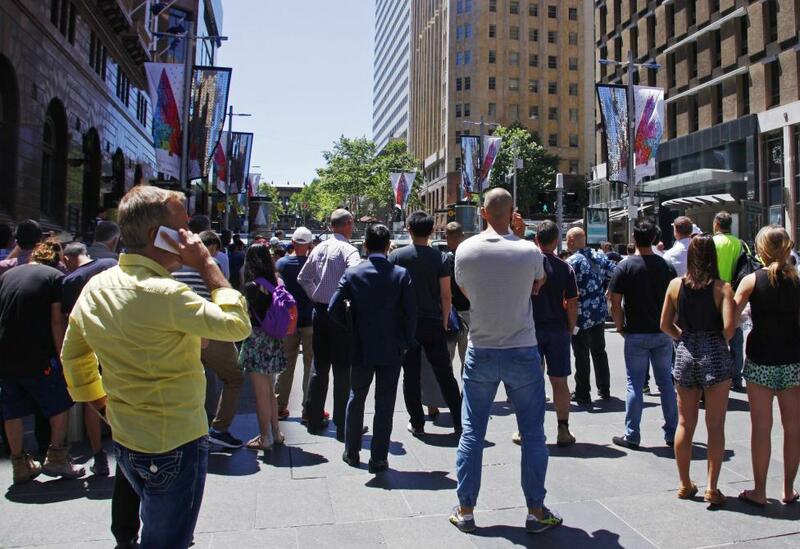 People standing behind a police cordon look towards Lindt cafe in Martin Place. 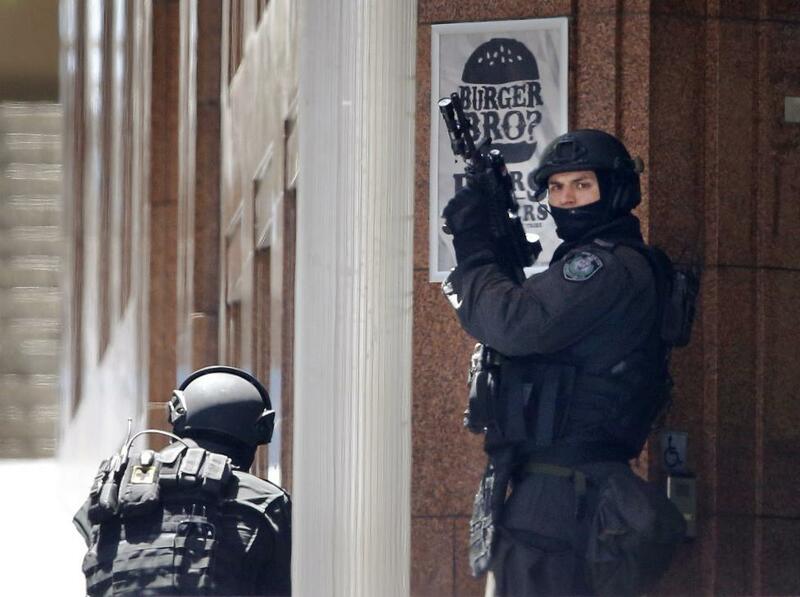 Police officers position themselves at a corner near Lindt cafe in Martin Place. 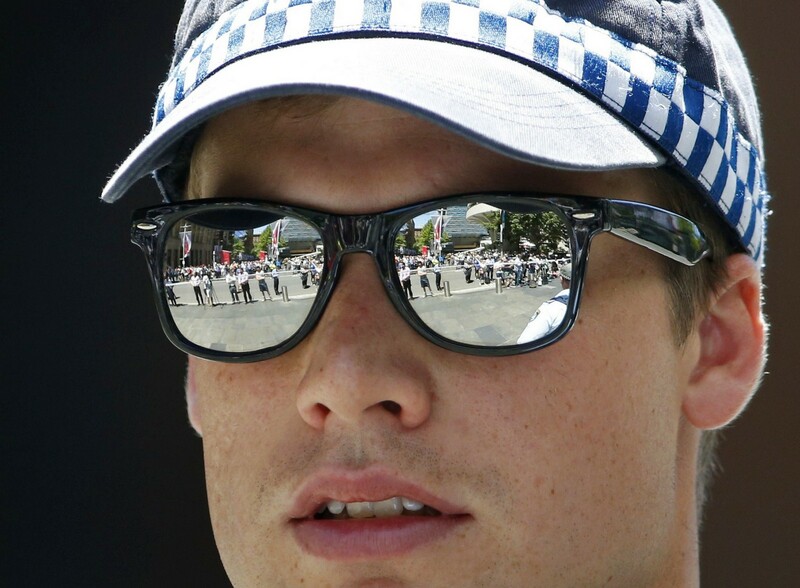 New South Wales state police officers are seen at a corner near Lindt cafe in Martin Place. 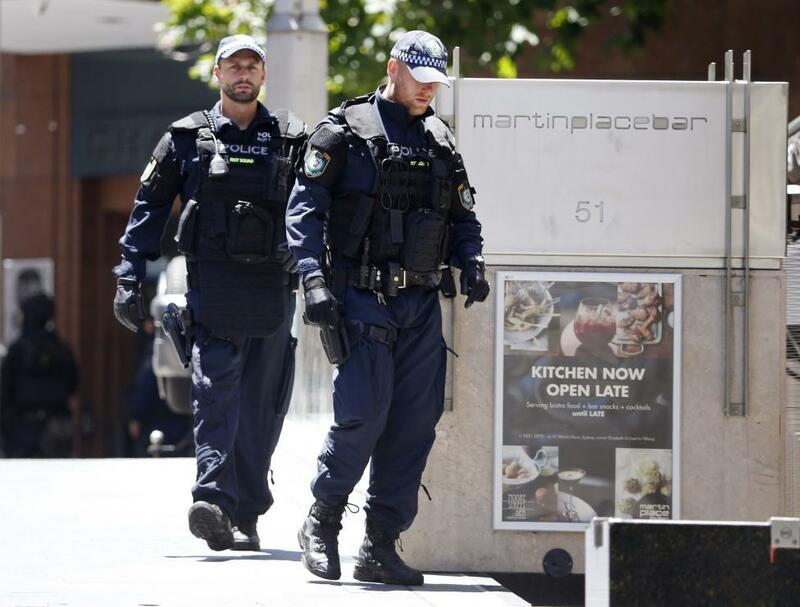 Police officers are seen at a corner near Lindt cafe in Martin Place. 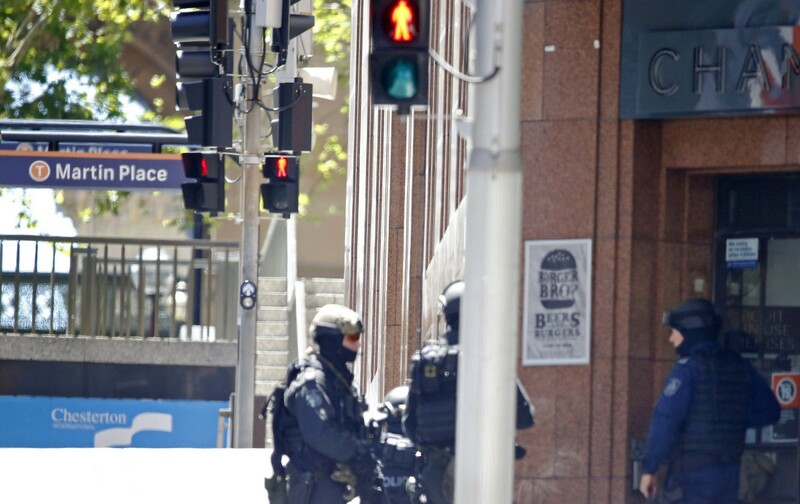 Police officers walk near Lindt cafe in Martin Place, where hostages are being held. 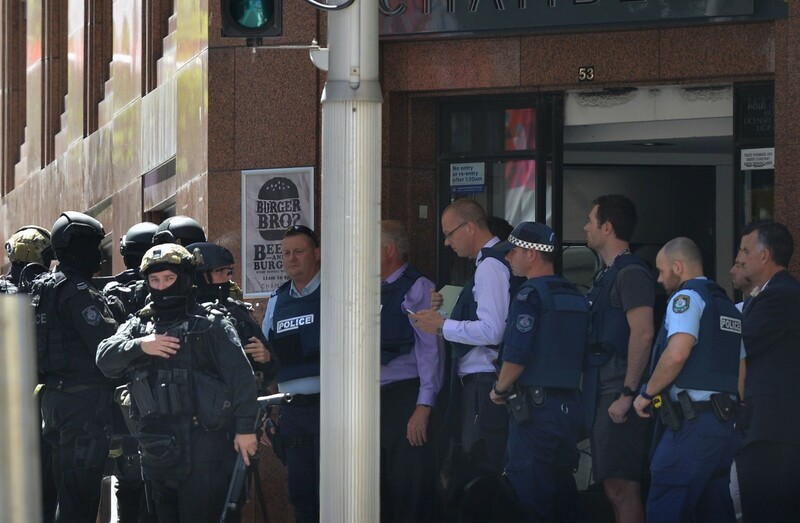 The police evacuate employees from the offices next to a cafe where hostages are being held. 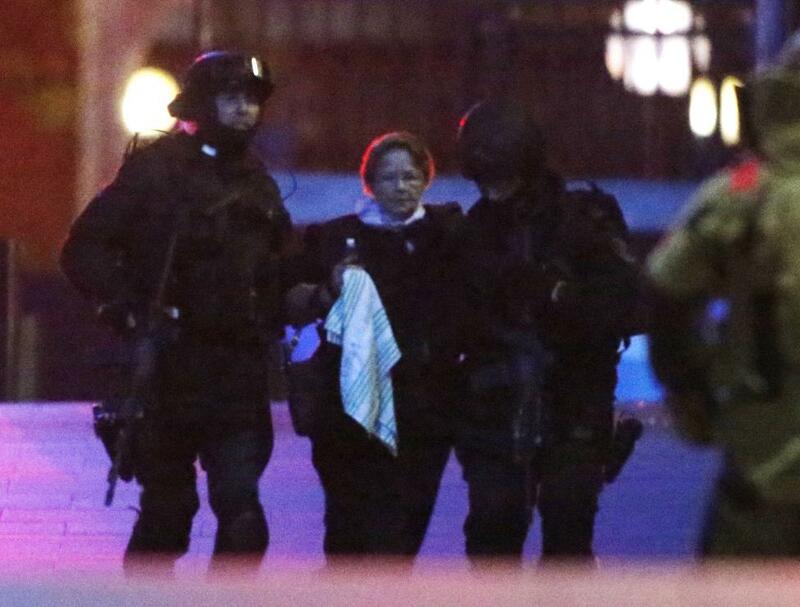 A hostage is being taken to safety. 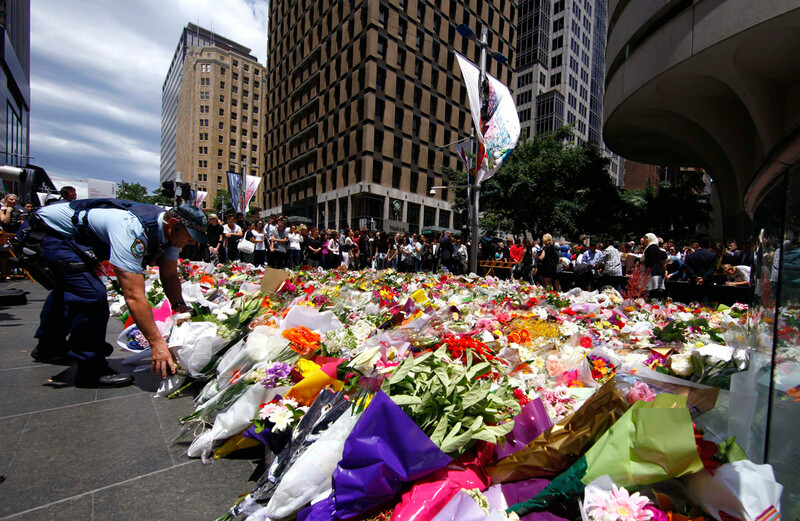 A floral tribute to the victims. 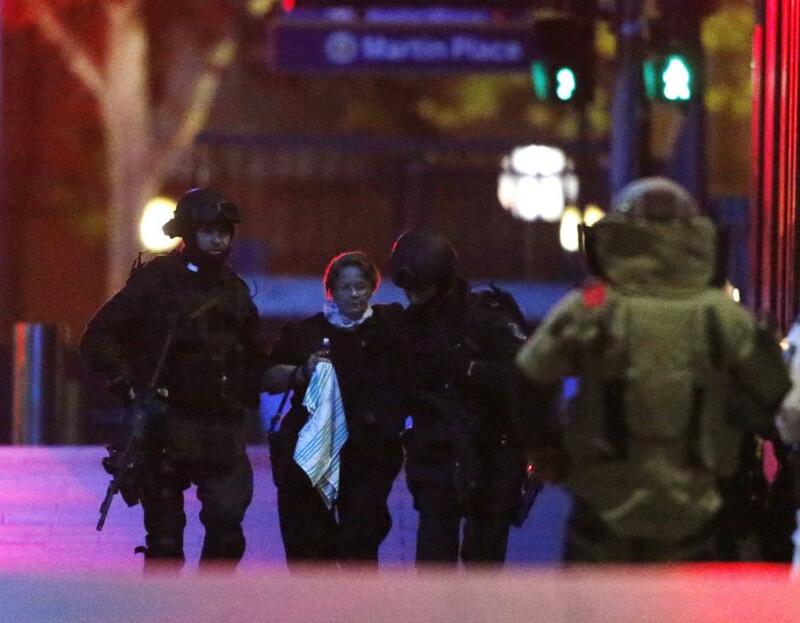 An injured hostage is being rushed to hospital. 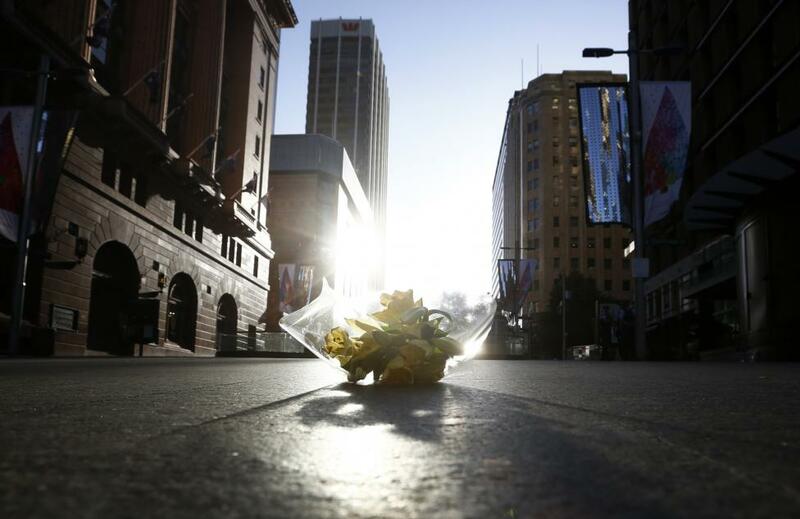 Australians from all walks of life mourn victims of the cafe siege. 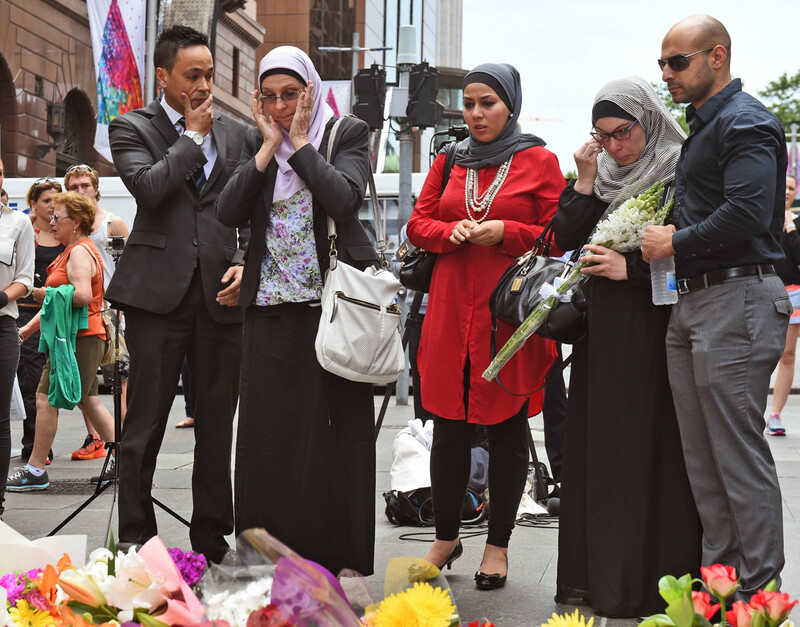 Muslims praying at the scene of the dramatic siege. 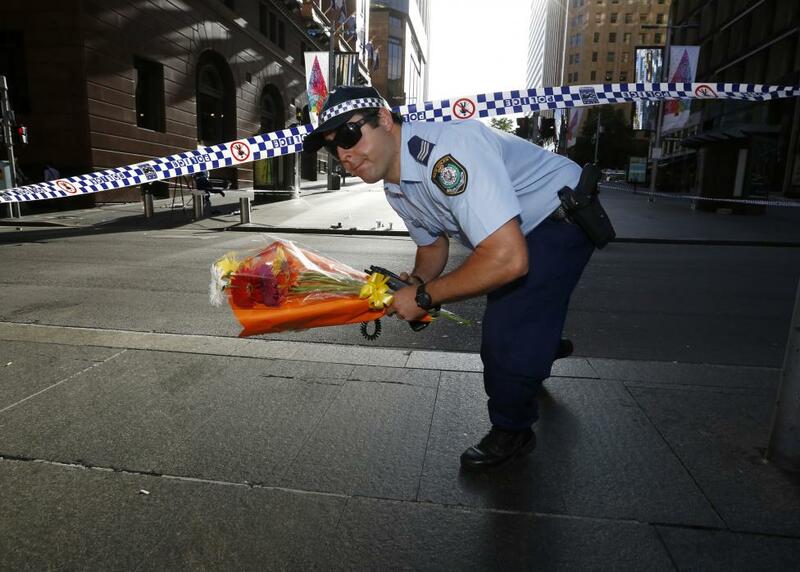 A sad and tragic event that darkens the festive spirit as Australians prepare for Christmas. 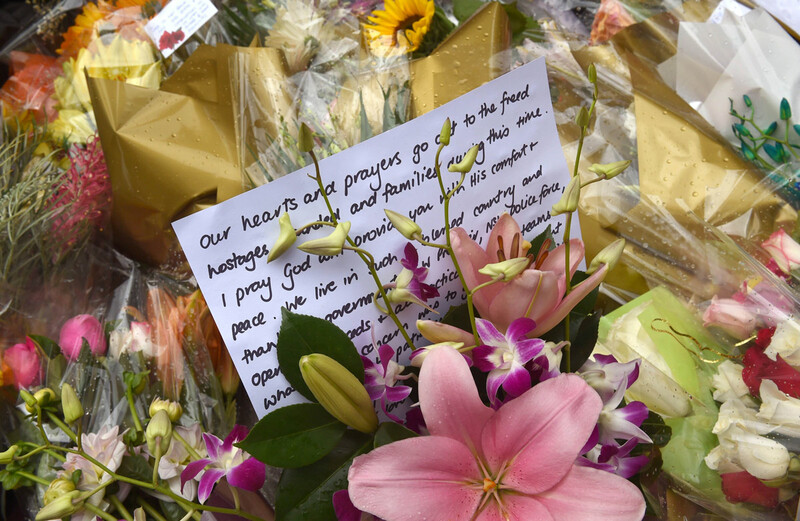 Floral tributes to the victims of the cafe siege.